A growing number of Canadian drilling rigs are being moved south of the border to take advantage of brighter prospects for oil and gas in the United States — and observers say it's unlikely they will ever return home. A week ago, Calgary-based Akita Drilling Ltd. announced it would enter the U.S. market by moving a rig from Western Canada into the prolific Permian Basin in West Texas. It said it is looking at moving more rigs south. Meanwhile, Calgary-based Trinidad Drilling Ltd. has announced it will move two idle drilling rigs from Western Canada to the same Texas oilfield, noting the move will boost its U.S. fleet to 69 rigs compared with 68 in Canada. Trinidad's American customers are so eager to hire Canadian rigs they are willing to help pay relocation costs, CEO Brent Conway said in an interview on Tuesday, adding he would rather avoid the headaches of a move if he could find profitable work in Canada. He said the investment climate in the U.S. makes him doubtful the rigs will ever return. And he may move more rigs south if customer demand remains strong. "What's happening in the U.S.? They're lowering taxes, they're building pipelines and they're starting to export oil," he said. In Canada, he added, "we've raised taxes, we're increasing costs because of labour laws that are changing, we aren't building pipelines and we can't get federal or provincial governments to do anything to help us." He said Canadian crew members likely won't move with their rigs to the U.S. Those rigs will instead be crewed by new American workers. Akita CEO Karl Ruud said in an interview the rig he's moving to Texas is under contract. He said he expects to earn bigger profits in the U.S. market because it has a more favourable regulatory system and tax rates. In a report this week, CIBC Capital Markets researchers said they expect Canadian oil and gas exploration activity will remain at a depressed rate this year with little change from 2017. "This will be in stark contrast to the Lower 48 where we expect U.S. onshore exploration and production spending to accelerate by upwards of 20 per cent, while a number of producers are presenting positive growth trajectories," they said. In its November forecast, the Canadian Association of Oilwell Drilling Contractors said 6,138 wells would be drilled in Canada in 2018, up just 107 from the total in 2017. Almost twice as many wells — 11,200 — were drilled in 2014 before the current industry slump began. "Most companies with the means to do so are exploring opportunities down south," said CAODC president Mark Scholz on Tuesday, pointing out that the Trump government's recent corporate tax cuts are making the U.S. even more attractive. "It's easier to do business down there, you can operate year-round. The margins and economics down there are much better. Both the federal government and the state governments have really indicated they are interested in expanding oil and gas development and exploration." He said the Canadian drilling fleet has shrunk from nearly 900 rigs in 2014 to 621 now and will likely fall to less than 600 this year. 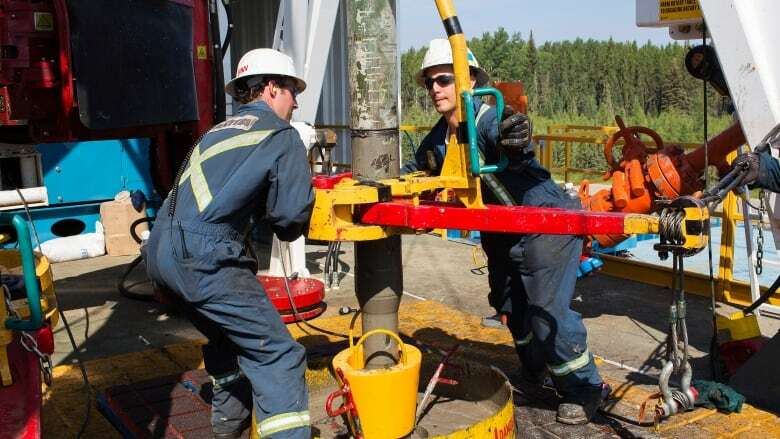 As of Jan. 22, only 52 per cent of Canada's rigs were active, although winter is the peak season for drilling in Canada because the frozen ground ensures access to backcountry drilling sites. Scholz said many parked rigs are being retired and "cannibalized" of useful equipment to keep other aging rigs working, but some are going to the United States or other jurisdictions. One of the Canadian energy industry's biggest hurdles continues to be lack of market access, Scholz said, adding the delays in building export oil pipelines means Canadian production is prevented from getting to markets with better commodity prices.